Aerial surveillance is a tool that can be useful for any operation. However, unmanned aerial systems (UAS) can be an expensive system to implement individual organizations. Instead, Six Maritime is able to provide companies with immediate aerial support when they need it. Our UAS security option is versatile and can be provided in maritime, land, night, day, open terrain or in close quarters with many surrounding people. With hundreds of hours of experience, our pilots have been approved by Prioria Robotics, the manufacturer, so you can be assured you choose the program you can trust. Overall, Six Maritime provides companies with quality surveillance and tracking while maintaining the safety of your personnel. Our UAS system can also identify problems and collect data from a safe distance. 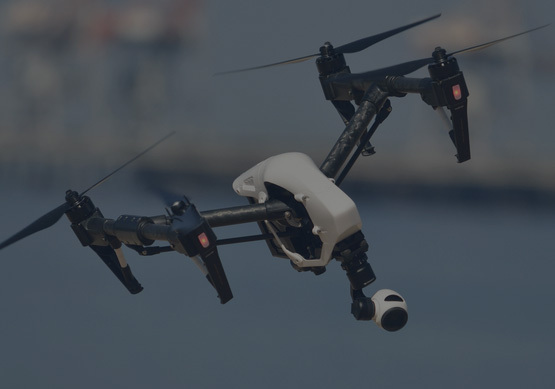 With unmanned aerial surveillance capabilities, your company can receive all of the benefits of an aerial surveillance system without the cost of supporting the entire system with your company’s funds. The Maveric is programmed for covert operations. During the day, it appears to be a bird. At night, if it is flying above 40 feet, it is not audible. This fixed wing system is the most advanced and is capable of covering 7 kilometers with a loiter period of 40 minutes. It is programmed to protect humans by identifying weapons from a safe distance. The Maveric can also identify personnel and track vehicles without the need of putting humans in danger. This UAS is preferred for its ability to carry different payloads. It can make deliveries or have stay-aboard payloads of up to 2.5 pounds. With an ability to fly in winds reaching 26 knots and a range of 3 kilometers, the VMAV Hex Rotor is reliable. Due to our relationship with the manufacturer, we have access to the latest designs and innovations. The manufacturer also provides us with custom prototypes that are specific to our needs. If you need it for security purposes, the VMAV Hex Rotor can provide warnings and solutions once it identifies a security threat. It also offers the Enhanced Watch Standing solutions to investigate areas that may be difficult for the safety and limitations of personnel. These include locations such as skyscrapers, sharp turns in roads and bridges. Rescue services are also provided by the VMAV Hex Rotor. It is able to deliver life jackets that are activated by salt-water to victims who may be drowning or have fallen overboard.